TOAST Trust No. 1 horse “All Strike” came in second for his barrier test on 13 Jan 2005. The other horse in the TOAST Trust No. 1, “Bronzino” had his first barrier practice on 20 Jan 2005 and he ran 2nd at his barrier test on 3 Feb 2005. Both horses have been entered for the same race (Restricted Maiden for 2&3 year old - weight for age - 1200m) on 20 Feb 2005. Presently, there are only 3 stakes left for TOAST Trust No.1. Those interested to take up the balance stakes can contact TOAST executive Esther Ko at 97392322. Not valid for purchase of Prima Taste ready-to-cook pastes and PFS Dining Vouchers. Not valid with set menus, promotional offers, other privilege cards and festive products. Not valid on the eves of and on public holidays, 15 days of Chinese New Year and special occasions (Valentine's Day, Mother's Day, Father's Day). If you want more information on PFS Pte Ltd visit their website at this link www.pfs.com.sg. • 14 Feb 2005 – TOAST has provided an additional service for members who wish to advertise their horses for sale or lease. Please refer to the "Benefits & Services" page on the website. • 12 Feb 2005 – Jeffrey J Kruger of Lyndhurst Stud Farm has joined TOAST as a member. Lyndhurst Stud Farm is one of the well-established studs in Australia since 1860. Jeffrey's father purchased the Stud in 1956. Lyndhurst stands 6 stallions and the two most known to Singapore would be Sequalo (AUS) and Carry The Flag (GB). 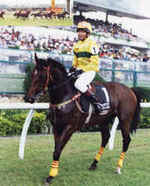 Sequalo is the sire of General Sequalo (trained in Singapore by Dr. Yeoh Kheng Chye and winner of 6 races already) and Sequalo was the Champion Queensland Sire 2003/2004 and Champion Queensland 2 Year Old Sire 2003/2004. Carry The Flag had 6 wins in in Europe and Singapore (1400m to 2400m) including the Singapore Gold Cup and 3rd in the Singapore Airlines International Cup. Carry The Flag is owned by our TOAST member Mr. Tan Kim Leng of Dragon Stable. Lyndhurst's other associate sires are Hayil (USA) by Dayjur, Canadian Silver (CAN) by Geiger Counter, Irish Royal (IRE) by Danehill and last but not least their grand old boy Celestial Dancer (IRE) by Godswalk. Celestial Dancer is now 26 years of age. More information on Lyndhurst Stud Farm can be found on the "Links" section of the TOAST website. • 8 Feb 2005 – TOAST is pleased to announce the formation of TOAST Trust No. 2. Details on the new TOAST Trust can be found at the TOAST Racing Trust page. Mr. Tee Eng Kiong playing with his son, two-and-half-month old baby Jonathan. • 25 Jan 2005 – "I am proud to be a TOAST Trust No. 1 Stakeholder and I believe TOAST has formed a solid foundation in the horse racing industry by providing professional advices and services to its stakeholders especially for first timer like myself. In addition, TOAST is also a good place to widen my personal interest, get to know more people from different background and also to explore new opportunities.” said Melvin Ong, director of one of the biggest forklifts and heavy machinery distributors, whose operations are based in Penang, Malaysia. 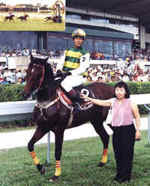 • 3 Jan 2005 – Retired professional racehorse “Con Soborno” was named “Horse of the Year 2004” with 3 wins and 3 seconds (from 1600m to 1800m) in the Pro-Amateur Racing circuit in Malaysia. He is a small built horse weighing between 427 and 440 kg but has always carried the top weight of 79½ kg in all his amateur races. 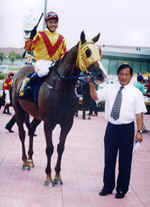 “Con Soborno” was trained by Singapore-based trainer Patrick Shaw when racing in professional rank. • 31 Dec 2004 – TOAST Committee needs two TOAST members to help audit the Accounts for the year ending 2004 and 2005. Please contact TOAST executive Esther Ko at 97392322 if you are willing to volunteer your services. • 30 Dec 2004 – Our TOAST member Dato Tan Chin Nam has been very supportive of TOAST. He will continue to provide his advice towards the progress and upgrading of horse racing in Singapore. He has leased his well-bred horse “Bronzino” for TOAST Trust No. 1. Dato Tan is well known in the Australian racing industry. He has been highly successful in the Melbourne Cup races with 3 wins from “Think Big” and “Saintly”. This accomplishment is one that is rarely achievable. Both horses were trained by trainer Bart Cummings. Bart has been nicknamed “Cup King” due to the fact that he has won Australia’s greatest race, the Melbourne Cup a record 11 times. • 29 Dec 2004 – TOAST Member Steven Cheow has kindly volunteered to provide his service in maintaining and administering the TOAST website. He is a stakeholder of the STCRM Racing Trust. He was previously working in the IT department in the banking industry. He has now retired. • 29 Dec 2004 – TOAST and SNTC have incorporated links to each other's websites on their respective internet pages. • 14 Dec 2004 – TOAST Committee has accepted the resignation of Co-opt Committee Member Dr Omie Rangabashyam. TOAST expresses its gratitude to Dr Omie for his past contributions. • 11 Dec 2004 – TOAST Trust No. 1 stakeholder Dr Low Hong Tong started owning racehorses with friends about 8 years ago. He rode in Pro-Amateur Race Meetings in Singapore and Malaysia during the 1990s. He was Hon Sec of Bukit Timah Saddle Club (BTSC) for 9 years and Hon Sec of Equestrian Federation of Singapore (EFS) for 3 years. Presently he is the Hon Sec of TOAST. He is actively riding at BTSC and he owns the retired racehorse Goldvision. One of the functions of TOAST is to provide a new lease of life to racehorses after their racing career. Dr Low believes that TOAST is an excellent arrangement for racing enthusiasts to own racehorses at an affordable cost. Through TOAST the stakeholders can share their knowledge and experiences of successful racehorse ownerships. • 7 Dec 2004 – TOAST website was officially launched. Congratulations and praises were received from Members, SNTC and friends. They found the website to be informative, transparent, professional…etc.